Thanks to Angelo, Pew Charitable Trust, and Friends of the Monument for the campaign to have a national marine monument designated in the CNMI. It's now official. 1. The declaration doesn't specify that NOAA Sanctuaries will be in charge. While both Interior and Commerce/NOAA have responsibility, the repeated reference to "fisheries" looks like the declaration leaves the door open for Wespac to run the show. As if that could possibly be a good thing for environmental protection. 2. The Advisory Committee will be 3 CNMI government officials recommended by the Governor, along with two selections by Defense and the Coast Guard respectively. There is NO room for indigenous or environmental advocates on the Advisory Council! Who will the Governor nominate? Fitial only agreed in the end and his "support" is untested. Besides, it seems as if his choices for appointments are limited to those working for the government, so people most qualified, like Angelo Villagomez and Ken Kramer and Ike Cabrera are not "eligible" for advisory council positions. People who ardently opposed the monument, like John Joyner and Sylvan (Igisomar? ), however, are. 3. I've got no problem with allowing sustenance and traditional indigenous fishing, but... Recreational fishing? 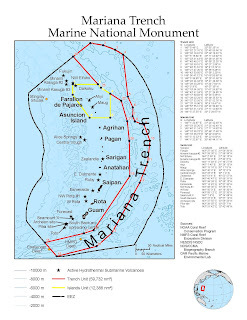 Allowed per the declaration, despite the overwhelming evidence from other marine reserves that show that recreational fishing is also destructive of habitat and, of course, marine life. I'm sort of happy--we got a national marine monument. I'm sort of happy--it's fairly large. I'm sort of happy--we did it!! !But I'm sort of worried, too. It's not quite right. Reuters South Africa--I'm not sure about this link--sorry. There are loads more of local newspapers in the US carrying the story--from Cleveland to Miami, from Bellingham to Raleigh, etc. On the world front, Angelo reports stories also in Pakistan and Zimbabwe newspapers, but I didn't find those. Good post Jane. I figure that National Monuments are alot easier to advocate for, than non-monuments. My bet is, over the years, there will be a great lean towards changes that incorporate bans on any type of commercial activity that disrupts the purpose of the monument. There are no buffalo hunts in Yellowstone, and I figure there will end up being no longliners in monument waters. A fuss over a national monument carries alot more weight. It's easy to get caught up in the petty politics here. I'm disgusted with Fitial's announcement, published in the newspaper today, blaming Pew for divisive tactics. Talk about biting the hand that feeds you...if it weren't for Pew putting us in the hopper for this wonderful gift, we would never have gotten it. Besides, that was John Gourley and Wespac and their crowd who used divisive tactics--like name-calling, race-baiting, and lies.